While most of the gun laws in Alabama are pretty straightforward, there are still a few things to pay attention to when buying and owning a firearm. We’ll go over exactly how to buy a handgun and long gun in Alabama, and also what you can do with your shiny new toy once you have it in your hands. Lucky for you, buying a gun in the great state of Alabama is about as fast and easy as it gets. Just How Easy Is It to Buy a Handgun? No permit is required to buy a handgun in Alabama. There are a few requirements though. If you’re buying from a licensed gun dealer, you’ll also have to submit to an instant background check. Private sales can avoid the background check. There Are a Few Disqualifiers, However. Hopefully none of you reading this falls into any of those categories! Even if you are disqualified from buying a handgun right now, if your firearms rights are restored through legal procedures (like a pardon), then you can buy that Glock 19 after all! What If I’m Not Old Enough? Good news for firearms collectors! Handguns that qualify as curiosities or ornaments are exempt from the laws on purchase and ownership! That means your 15 year-old neighbor can buy your collection of WWI firearms from you if he coughs up the cash. Smith and Wesson 45 Cal Military issue from WWI. Like with handguns, no permit is required to purchase a long gun in Alabama. Also, the same disqualifiers apply. There are some slight difference in buying a long gun, however. Because it’s Alabama, they’ve got a special gun law just for you. 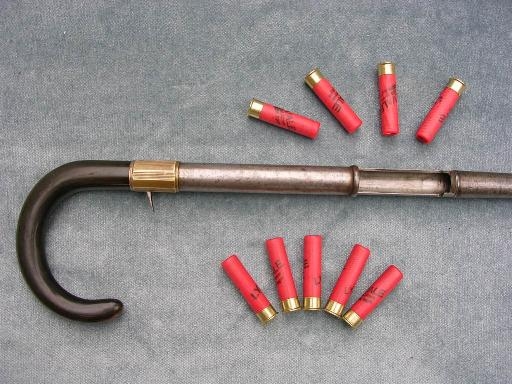 In the state of Alabama, it is illegal to carry a rifle or shotgun walking cane. Once you’ve got your shiny new gun in hand, you’ll need to make sure you follow the laws for carrying a firearm in the state. Where Can I Carry My Handgun? Alabama is one of the growing number of Constitutional Carry states, where you do not need a permit to openly carry your handgun. However, a holster is required. Sticking the gun in your back pocket doesn’t count. Carrying gun in back pocket. Carrying your gun in the car is not permitted, though, without a concealed carry permit. Should I Get a Concealed Carry Permit? Concealed carry in Alabama typically requires a permit, which we go into detail in our CCW section. Basically, you are free to do whatever you want when you are on your own property. What About Carrying My Long Gun? To keep things simple, Alabama decided to have the same carry laws that apply to handguns apply to long guns also. How Do I Register My Guns? You can’t. Because you don’t need to! Alabama does not impose restrictions like firearm registration or reduced-capacity magazine laws on its residents. Enjoy the benefits of living in a free state! 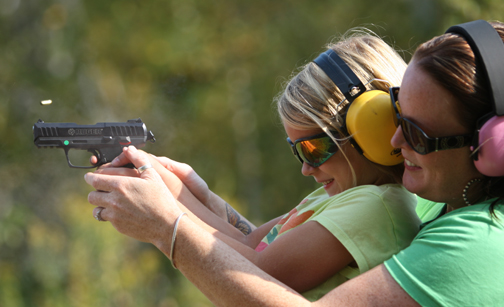 Aside from practicing at the range, your firearms will come in handy if you ever need to defend yourself. 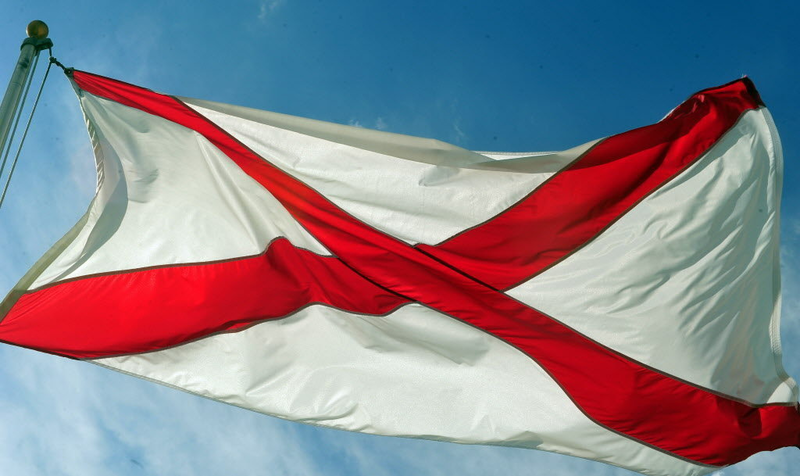 Alabama has a “Castle Doctrine” and “Stand Your Ground” statute. Breaking and entering into your house or vehicle. 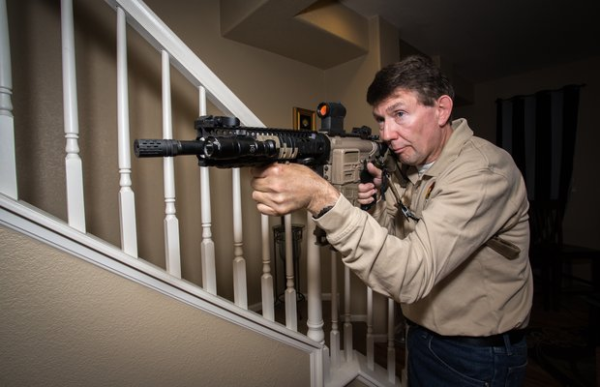 Even with the Castle Doctrine, it is still a good idea to decide what type of force is appropriate in defending yourself. Deadly force is not always necessary in every situation. With all the excitement of getting your brand spanking new toy, don’t forget to keep it somewhere safe! Alabama does not have any laws on storage of firearms, but for those of you with children, or just want to keep your collection of firearms safely locked away when you’re out of the house, a sturdy safe or inexpensive gun cabinet will do just the trick. Anyone who just want to keep their handguns under lock and key can spring for a handgun safe and call it a day.